TSS – How long has this game been in development? Iizuka – We started prototyping the different geometries and stages during Sonic Generations. So, about 2 & 1/2 years. TSS – Who is the main director on this game? Iizuka – Morio Kishimoto who did Sonic Colors and Heido Bayashi (sorry if mispelled) for the 3DS version who was the same director of the Colors DS version. TSS – Who is the music composer this time? Iizuka – Tomoya Ohtani. He did the music for Sonic Unleashed. TSS – We know you can use gadgets in the game to help Sonic. Are these Eggman’s gadgets or Tails? TSS – Was the unreleased Sonic X-Treme any influence on this game? Iizuka – No. Not at all. Actually, the developers of this game don’t know about Sonic X-Treme so it’s all new. TSS – What was the reason for going with more simple and whimsical visuals? Iizuka – Basically, so Sonic Generations and Unleashed was very beautiful with detailed HD graphics. It was great, but it had disadvantages as well. The rings and enemies can be hard to see at times and could merge with the background a little. Also, since the visuals were so heavy, we were pretty much locked at 30 FPS. So this new style makes things pop visually, things such as rings and enemies are more more easier to track and gives us 60 fps and a lot more freedom in development on how we build the stages. TSS – Can you give us more details on the Deadly Six? Iizuka – Deadly Six are a new set of creatures never encountered before called “Zeti”. They live in a unexplored area of Sonic’s world “Lost Hex” and Eggman is trying to force them to work with him and he loses control of them and he has to team up with Sonic to try and take them out. TSS – What was the reason for going exclusively with Nintendo on these three upcoming Sonic games? 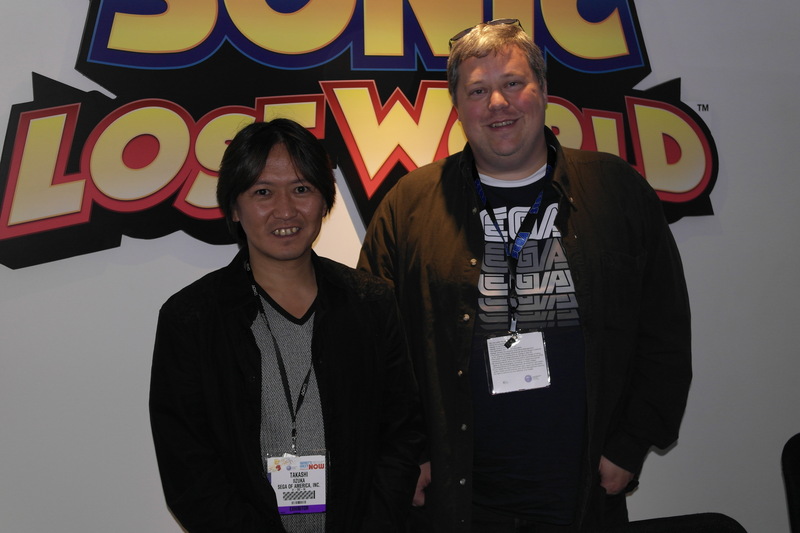 Iizuka – When we were first developing Sonic Lost World, the Wii U was not even announced yet and we were developing it on PC. So, the Wii U was the right choice for a couple of reasons. First of all, the second screen gave us extra options and advantages also, we think the Wii U is where fans of action platform games are going to. Plus we’ve had much success with Nintendo in the past. TSS – Can the game be played on the Pro controller or gamepad only? TSS – What makes this game so unique compared to other Sonic games? Iizuka – Probably the easiest thing is the different geometries as you can see. It’s tube shapes and other style of geometry. It’s not just a series of tubes (laughs). Another cool thing the graphics style allows us to do is the each stage has a very unique style and aesthetic to it. Each stage has it’s own visual style so there’s a lot more to it. TSS – Many on the internet have been comparing the game to Mario Galaxy. Do you feel the comparison is apt, or what do you feel sets this game apart from it? Iizuka – Basically, because we have these geometries with their own gravity you hop to, you can kinda see the comparison there, but if you play the game on the show floor I think you’ll see the biggest difference is that it still feels and moves like a Sonic game. TSS – Can you tell us anything about the new Wisp powers? Iizuka – As you’ve probably seen, the WiiU version has the Lazer power in the demo and the 3DS version has the new asteroid power and the drill power you’ve seen in the original version. Other than that we are not talking about new powers at this time, but we will in the near future. TSS – What kind of unlockables does collecting Red Rings and freeing animals give you? Iizuka – (Laughs) That would be telling. We’ll be talking about that more in the future, but one thing we can say is that rescuing the animals will have a positive impact on your game. Just to be clear it’s not just the animals in the cages there will be some hidden in the stages you can free as well. The more you free, the better the impact will be later in the game. TSS – Sonic Lost World represent s pretty big departure from recent Sonic tiles. What made you decide to change the formula up so drastically? Iizuka – Basically, we were proud of our accomplishments on Unleashed, Colors and Generations. But we felt we explored that style of gameplay quite a bit and didn’t want too keep playing in that same space. The developers wanted to explore new styles of gameplay and part of the goal there was to make pure platform action a bigger part of the experience this time. Unleashed through Generations, we are proud of them but focus was pretty much on speed and platforming would happen from time to time, but the developers wanted to make it more of a traditional platformer. Not that we want to lose the speed. That’s why there’s still plenty of running and such. It’s still a Sonic game, but we want you to have more control over the speed this time around. TSS – Thank you so much for your time. Sonic Lost World will be available later this fall. Just like trying to play as Tails in Sonic 4 Episode II. It’s a Wii U and 3DS exclusive, not Xbox 360. And not Xbox One either…! And PS4! And PS3! And Wii! And PS Vita! And Android! And iOS! Wait, what was your point again? Was really hoping someone would ask about the absence of the hedgehog engine. From what we’ve seen, MK8 has better lighting than Lost World, and Nintendo didn’t invest three years into a lighting engine. What gives? I’ve heard that Sonic Lost World uses a completely new engine called the WNT Engine. It uses the power of GPU shaders to intensify Sonic’s running abilities by adding geometry vertices dynamically through cloud-based interaction. I’m fairly certain the WNT Engine doesn’t cover lighting from what you’ve described as vertices handle sculpt/model. It uses Unified Shader Model to combine dynamic geometry adjustment with real-time fragment and pixel shading in order to combine high dynamic-range lighting with realistic model adjustments, including real-time fur simulation. Not every game needs to have fantastic lighting. Generations, Colors, and Unleashed didn’t have radical lighting either, but I must say, the lighting in MK8 really makes it look like an Xbox One or PS4 game! So that was what looked so visually attractive about it in the trailer, it was the lighting! It is quite amazing. So, the whole X-Treme similarity was just a coincidence after all. It still looks like a spiritual successor! “TSS – Was the unreleased Sonic X-Treme any influence on this game? Not buying this. There’s nooooo way X-Treme isn’t an influence! It’s kinda hard to say for sure. The US side of sega is DEFINATELY trying to link it with the game, Aaron Webber said so the other day and theres even a Sonic X-Treme piece of merchandise in Sega’s E3 booth, But the Japanese side hasn’t really done this at all. Oh yeah, there is no way that they didn’t know about sonic xtreme! Okay, I can understand the coincidence between this and Sonic X-Treme with gravity controls… but the story is SO similar to one of the conceptual plots of Sonic X-Treme as well! I’m sorry, but that is one HUGE coincidence there. Even the style is similar. There’s a patch of red stylized flowers from lost world that look identical to the one in X-treme, when Retro compared side to side with a red patch of flowers texture from the game files. I refuse to believe that there was NOTHING taken from X-treme. It maybe some of the older developers that have been dropping hints to Sonic X-treme all over the place. I love those developers. Iizuka pretty much echoed what Aaron said. Give you more control over the speed, more platforming. So many fans have been crying out for this. Thank you Sonic Team! Ditto that! I’ve been saying that since the very beginning! I just hope the 3DS version turns out the same. This is so cool! I can’t wait for the review of the demo! If anything though, I wish we could have asked him if Amy’s voice actor will be the same because I will not be able to tolerate a full story line of a Sonic game with that mini-mouse voice, yet there are SOME signs that she has improved with her voice. Amy’s voice clips in All-stars racing Transformed were okay, but some of them still stuck out too much because they were so unfit (Her voice in M&S London 2012 Olympics was a total bomb.). Maybe if we are lucky, SEGA brought back Lisa Ortiz all together, but the chances are low. Anyways, Let’s keep this news coming! I’m a bit disappointed you didn’t ask about why the wisps aren’t back on Planet Wisp, but it’s nice to get some details on the new Zeti. Well, considering the Wisps were also indigenous to Sweet Mountain, Aquarium Park, and Asteroid Coaster, I’d say it’s fair that they’ve become the designated Lumas of the series. We got alien planets? We got alien Wisps. Except that this interview said this is a Lost piece of Sonic’s world and not an alien planet. Pingback: SEGA's Takashi Iizuka; the Wii U is where fans of action platform games are going to. How can a development team not know about Sonic X-Treme? I would have thought if you were working for a company, you’d know about their back catalogue and such? Interesting review. “Zeti”, can’t say I didn’t see that coming XD However, another part of Sonic’s world…Solar system, perhaps? In which case, Sonic, you have a REALLY whacked up solar system. …I shouldn’t be surprised. As it is, I don’t mind the platforming. I’m iffy on this game but gosh darnit I’ll try it before I make any judgments. I hope we get to see things back to Unleashed and such – I enjoyed the story in that game. Also monsters. No wonder Windy Hill Zone sounds so Rooftop-Run-ish. ….It was being developed for the PC? I’m done! Not buying! jk. On the other hand, I’m quite surprised they were actually going to release it on PC. That would have made my day. Then Nintendo came. I guess Wii U is a good platform for Sonic, thinking about how successful Sonic Colours was on Wii, so I’m good, but I still kinda hope the original release plan would have been kept. Because I support PC. But on other news, wow, the composer from Unleashed is coming back? Nice, I really loved that game’s music, even though I hated it otherwise. And I’m not buying Iizuka’s claim on not having similarities with X-treme. It’s quite obvious, to be honest 😐 Aaron Webber even confirmed it. So Nuckles87 talk Takashi lizuka about Sonic lost world so we are know is going to be on fall like October 13 after Pokemon x and y for Nintendo 3ds Rlease October 12 . also I saw the different how in Sonic lost world Sonic could cut with like a scissor attack each emery then I saw Sonic could run walls so fast and run the dash the wall on square to run then doogle the emery like in Sonic Heroes Final-fortress the lazers. Seeing how much slower this game is compared to the past, you guys should’ve asked if Lost Worlds speed physics were at least momentum based. So thats why Windy Hill reminded me of Spongonia. Tekashi Iizuka worked on the sound! BTW where is Jun Senoue? And is Crush 40 gonna come back soon? I hope so! I hope so too. They have to use Sonic Youth for something. No wonder I love the music! I’m glad the Unleashed composer is back, I loved nearly every piece of music in Unleashed.